A Scouser eh ? Blue or Red ? Are you doing Lancaster tonight then ? Probably the closest gig for you - no ? Another diehard ha ha !! Was there much change to the setlists - Berlin and Paris were almost identical. Why doesn't anyone ask us Yanks who we support? So, Mr. Dundee, Are you a Fifer or a Dee? Why don't we ask Yanks what team they support ? Who cares about football!? The Yankees are in the WORLD SERIES!!!! Yay, another American fan! I thought I was the only one here. I'm American. I've been here since the beginning. I don't know how you Europeans watch soccer/futbol. I can't imagine a more boring sport to watch. Well... golf. Baseball is by far worse than golf. Maybe not the individual games, but the fact that each season lasts 10 MONTHS LONG and there's like A BILLION GAMES that each are FOUR GRUELING HOURS LONG (OR MORE). Golf takes up one or two tournaments per year and rarely gets primetime television space. Baseball makes me want to commit hara kari. I hate sport of nearly all variety but baseball is my all-time most hated, if you haven't figured that out by now. baseball is quite a commitment. 162 games just in the regular season. and it's true... a lot of american league games go about 4 hours. it's so draining just as a spectator, that i pretty much don't watch any other sport. Football is awesome. It's art. To watch the set up...a perfectly placed pass between two defenders, onside, resulting in a goal over the pleading, outstreched arms of the opposing team's goalie is one of the most amazing things in the sporting world, in my opinion. I wish I had cable so I could watch more of it. World Cup '98 is what did it for me. I really thought Scotland would do better than they did. 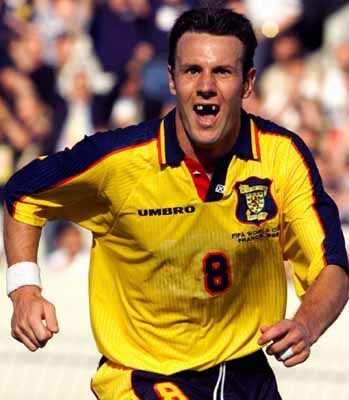 Craig Burley made me a Scotland fan for life. I love hockey most of all, but also rugby and American football. Don't care too much for baseball...or golf. I think this the goal that everyone in Scotland will never forget - beating France on home turf for the 2008 euro qualifiers - they thought getting beat by Scotland at Hampden was a fluke, and were adamant they were about to teach us a lesson when Scotalnd played them in France, but to then do this to them...amazing...they were in totla shock and disbelief. yeah perty damn sweet goal! Soccer (footy for ya overseas!) is my fave sport to play. been playing for close to 30 years now (and the ol legs just dont have it like they used ta) but never been much of a "watch" sports kinda guy. if i do its usually hockey (and i cant even skate) because it has just the right amount of goals vs length of game. baseball is slow and best watched live with tons of been and hotdogs, football (american) is pretty much same. basketball - too damn many baskets just makes ya lose interest in the individual ones.. and soccer is a damn big pitch and too few goals per game (sometimes none). as a rule i stick to watchin the various playoffs with my buds and just enjoy the social aspect of it and the higher intensity that playoffs bring.. but i do love to play all sports - when you're playin it dont seem so slow maybe..
Haven't had the chance to write the post I mean to but I love Camera Obscura so much. I like to take them with me in my pocket and sit under shady trees & draw. They are amazing. Their newest album has helped me immensely survive a heartbreak of three years. Nothing else has proved this influential for me as they have. Ever since I've listened to them, I've been able to draw again (haven't been able to for about 2 years). In a way this band, their music, has given me my voice back. Hrm... okay, I'm finished with my sentimental rambling! Quietwater - another Americano !! Welcome. very very true indeed! don't tell the others..but soccer is the best - i was just trying to be sympathetic! Was doing a bit of that lurkin' too gra.